Griff the Invisible is a 2010 Australian romantic comedy-drama film written and directed by Leon Ford. The story is about Griff (Ryan Kwanten) a socially awkward office worker who spends his days being bullied by his workmates. At night he is Griff the Invisible, a superhero who roams the streets of his neighbourhood, protecting the innocent. Griff has his world turned upside down when he meets Melody (Maeve Dermody), the beautiful young daughter of a hardware store owner, who shares his passion for the impossible. The film won the AACTA award for Best Original Screenplay. Griff the Invisible had its world premiere at the 2010 Toronto International Film Festival (TIFF), where it was well received by audiences "who seemed charmed by this offbeat tale". The film also screened at the 2011 Berlin International Film Festival in February 2011 in the "generation" sidebar where it was well received by a predominantly teenage crowd. Griff is a socially awkward person who gets bullied by co-worker Tony by day. At night he dons the costume of a superhero and fights criminals. At times his brother Tim, visits him. One day Tim tells Griff about his girlfriend 'Melody' and brings her with him the next time he visits. Melody is shown to be a girl who lives in a world of absurd thoughts, who also isn't comfortable with other people. One day Griff gets an idea about becoming invisible and after some research, finds himself doing experiments by purchasing things from Melody's father's shop. He makes himself a suit and wearing it, goes to his office but is caught on camera, not yet revealing his face. Griff again makes an invisibility cloak but this time his boss sees his face on camera he gets fired from his job. That night, Tony calls a local goon and beats Griff in an alley. He returns home to retrieve his suit and police catch a bloodied Griff and later release him with a warning. Slowly Griff and Melody fall in love, and Melody tries to encourage Griff in his work by presenting him with a 'Universal SUIT' sent anonymously. It becomes apparent that the superhero, the goons he beats and his invisibility are just his imagination. Tim gets hold of this and asks Melody why she is encouraging him, to which Melody replies Griff is a freak like her and they love living like that. Griff hears this and realizes the fact that everything is his imagination. He destroys the costume and all computers he was using in his imaginary world. He goes to Melody's house for dinner where she realizes Griff no more believes in his imaginary world. Soon afterwards she comes to Griff's home and tells him he was the only one who went into her world and that was the reason she loved him, but now, he also is behaving like normal people, so she can't love him anymore. With saying that, she leaves his house and cries leaning on his door. Suddenly, she falls through the door (as she was seen trying earlier) and lands in Griff's room. Griff takes her into his arms and she utters, "You can believe it." They share a passionate kiss. Soon after, a package falls through the mail slot of Griff's door with Melody's name written on it. Tim is then shown walking away with his new girlfriend. Griff runs into his room to put on his invisible suit, and Melody opens the box. Inside is a note from Tim that says, "Use these to be the only one who can see Griff when he's invisible. So he doesn't have to wear the hat." The device resembles a View-Master stereoscopic toy. Griff enters unseen into the room, and when Melody holds up the device to her eyes, she can see him standing there again. They smile at each other as the film ends. The film is directed by Leon Ford and produced by Nicole O'Donohue. Executive producers are Jan Chapman (The Piano, Lantana, Bright Star) and Scott Meek (Velvet Goldmine). The idea was conceived by Ford while sitting in a café watching a child playing by himself. "He was in this whole other exciting world and it looked much more exciting than the one we were in. I thought isn't it a shame that I'm not allowed to do that anymore. So I just thought what if you did have a guy who chose not to lose that side of his childhood?" From a draft originally written in 2005, Ford and O'Donohue (Green Park Pictures) took the project to Screen Australia's Indivision Script Lab in 2008. The agency invested in Griff through its IndiVision Production Fund, and it was then up to the filmmakers to raise the rest of the $2.7 million budget. Executive Producer Scott Meek became involved after Leon Ford asked him to read the script, which he loved. Jan Chapman became involved in March 2009 and has said in an interview that "there's something incredibly exciting and refreshing and challenging about getting a new young team just to do their first feature. When I went onto the set of Griff, it just felt alive and every single person was there wanting to their job and do their best...It's a really charming script and Leon Ford's a very talented young man." Casting began even before financing was complete. On casting Ryan Kwanten, best known for his role as Jason Stackhouse in True Blood, producer Nicole O'Donohue said, "I think we had a pretty good idea on Ryan's first test. It was amazing. He brought a real sensitivity to the role of Griff. He just kind of was Griff, there is no other way to say it. Ryan just brought so many layers to it straight away...the first test he did was quite a short little piece but there was a sneakiness, there was this real belief in the character. He just was Griff." Writer/director Leon Ford said he cast Ryan Kwanten based on test tapes. "I was here in Australia and he was in L.A. so we just spoke on the phone a lot. We didn't actually meet face-to-face until rehearsal, but we just had to make the call and say, "Let's just get him and we'll work out whether we get along later." Griff the Invisible was filmed on location in Sydney over five weeks, and was shot in and around Sydney's inner west, with Surry Hills as Griff's territory. Ford wrote it with that specific suburb in mind. Locations include Central Station, Haymarket, Hyde Park, Pyrmont and Surry Hills. Griff the Invisible was shot using 16mm film rather than digital, an aesthetic choice. 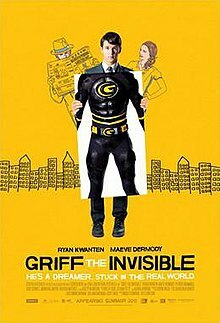 Griff the Invisible received mixed to positive reviews from critics and has a score of 62% on Rotten Tomatoes based on 53 reviews with an average rating of 5.9 out of 10. ^ "'Griff the Invisible': unconventional superhero | Analysis & Opinion". Blogs.Reuters.com. 12 September 2010. Archived from the original on 19 September 2010. Retrieved 1 February 2011. ^ Gavin, Rachael (20 December 2010). "Griff the Invisible to screen at the Berlin International Film Festival". If.com.au. Retrieved 1 February 2011. ^ Schaer, Cathrin (12 February 2011). "Behind the Screens: Kevin Spacey's latest tragedy". The New Zealand Herald. Retrieved 2 October 2011. ^ a b c "Griff the Invisible: birth of a superhero". Encore Magazine. 19 January 2010. Retrieved 1 February 2011. ^ a b Richey, Anne (2 October 2009). "Griff the Invisible: appears and about to be shot". Screen Hub. Retrieved 1 February 2011. ^ Richey, Anne (9 December 2009). "Jan Chapman: different little lifetimes". Screen Hub. Retrieved 1 February 2011. ^ "Griff the Invisible Director Leon Ford Dishes About Ryan Kwanten as Leading Man"
This page was last edited on 15 February 2019, at 22:53 (UTC).